Homeschool unit studies are something every homeschool family should at least consider. Unit studies don’t usually make up the bulk of our year, but doing a unit study allows students to study something they’re interested in. 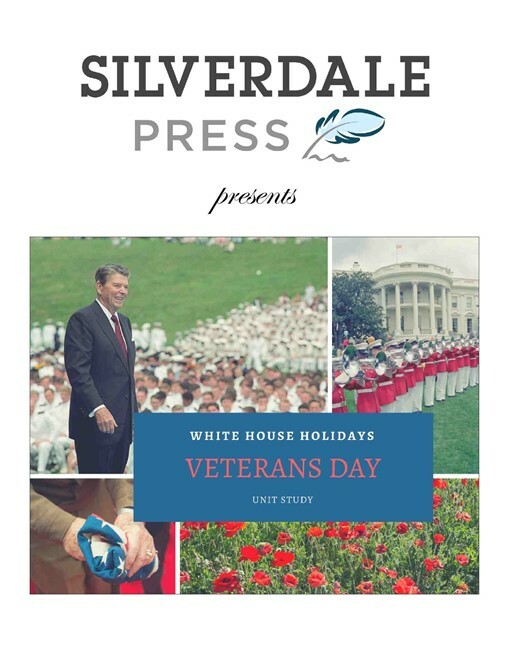 Today I’ve got a review for you that covers the White House Holidays Unit Studies from Silverdale Press LLC. These are lengthy unit studies, and they cover a LOT of history that extends far beyond just typical holiday topics. Each unit has lessons and activities for two age groups: K-6th, and 7th-12th. They’re for ages 5-18. Don’t worry too much about the exact grade level recommendations. Our unit studies came with all the materials for all ages. Older children who have been intensively studying history will still enjoy doing these along with a younger sibling, but you might want to bump them up to try some of the activities designed for 7th-12th. My oldest just finished 5th grade and he enjoyed the light activities we covered. If you’re adding this to another curriculum, then the elementary lessons are probably plenty for an upper-grade kid. I’m going to give you the total length of these units – it was 329 pages, not including all of the answer keys! That’s a lot of content. I like to print things out rather than have my children look at my computer screen. BUT. Don’t just print out the whole unit, like I did. There’s no need – you can just print out the lesson for the younger kids or the older kids, depending on which one you’re using. You don’t even need to print out anything unless you’re like me and you just like to have stuff printed. 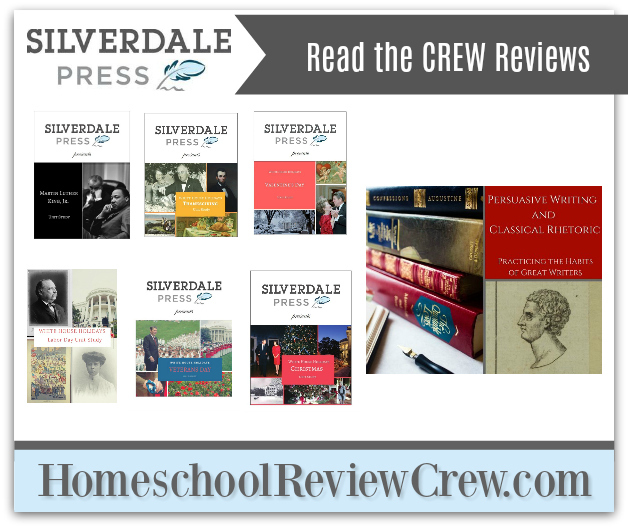 With 25 lessons in all for these, you could easily spend an entire school year doing these homeschool holiday unit studies. A younger kid’s K-6 lesson takes about three hours, or more if you have kids who have a lot of questions. My kids have a lot of questions. It took us longer. I had a goal to get through at least three units out of the six, but there was just no way for my kids to get through three units in six weeks. We got through two units during the review period, which had 8 lessons total. We didn’t do any lessons for 7th+ because my kids are not in that age range, but the teacher’s guide estimates a full day. You don’t need to do everything for the lesson in one day – you can break it up and do a little each day. If I were using these all year, I’ll break it up and do a little each day. Right now during our review period, I wanted to get through as many studies as we could. Obviously, we weren’t savoring each lesson like I’d like to, but I wanted us to really get a good feel for them. The lessons are set up well. I read a narrative to my kids that taught about the history and facts of the holiday. All three of my kids liked them. My youngest child, who just finished kindergarten and is one of those extremely active kids, was able to listen and get through them. A lot of it went over her head. She did the crafts pretty easily (with help) and she really loved the crafts and hands-on stuff. My middle child, who just finished 2nd, really loved these and seemed to be the perfect age for this. There is a lot in the lessons that I’d never heard before. This information is not something that you commonly hear. I didn’t double-check facts but they seem to be well-researched. I appreciate that they include primary sources. There is a teacher overview included with each lesson. It’s not long a long read, but it does add to my teacher prep work. It made it quick to plan what we’d need for the lesson. The lessons include the reading material you need (sometimes you have to look something up online), and the crafts use stuff that you probably have around the house. The Labor Day Unit Study is 53 pages total. It starts around the year 1882 and includes primary source content such as a political cartoon and many photos. The historical and social concepts of Lessons 1 and 2 include child labor, tenements, sweatshops, Eleanor Roosevelt, Unions, debate over who started Labor Day, and New York City history. We drew a picture of someone in a Labor Day parade holding a poster. That’s a lot of content and my kids had endless questions about it. Lesson 1 focused more on child labor, and Lesson 2 was about the first Labor Day. 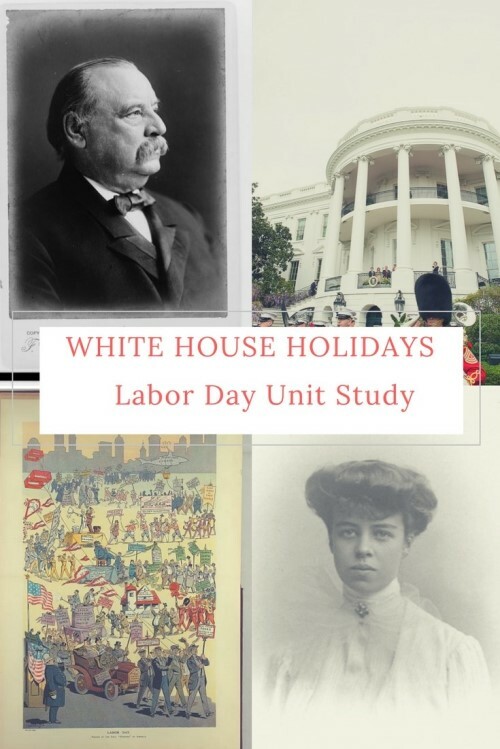 Lesson 3 dove into Grover Cleveland, the Pullman railroad strike, historical Chicago about 1894, the actual declaration of Labor Day as an official holiday, and had us searching online library databases for primary source photos. My kids liked this lesson a lot because we had just visited Chicago. The crafty activity was making a picture book to show the Pullman strike conflict through Labor Day. We aren’t especially craft-focused people, so we just glued pictures we printed from the royalty-free database and we made one stapled book for our family. If you wanted to, you could make something really beautiful and keep-sake-y, but we didn’t. It was simple to do but educationally valuable. My kids were also really into the trains. I’m not sure about some of the re-phrasing of Presidential powers in this unit. So…the Pullman strike…railway workers went on strike, which paralyzed the nation, and President Grover Cleveland sent in federal troops to bust up the strike. As someone who studied Constitutional law, I was thrown by some of the rephrasings in the unit study. The unit narrative says that President Cleveland sent in his own special police force, which I don’t think is an accurate way of rephrasing what happened. Police powers are generally state powers. The President has to “take Care that the Laws be faithfully executed,” but the Presidential responsibilities are rephrased in the unit study narrative as saying that the President had to “make sure that nobody destroyed property or committed violent acts.” This rephrasing seems like a very large expansion of Presidential powers to me. In this case, I did skim through the same lesson in the 7th-12th grade section and the same re-phrasing was there, but there were more details that I felt gave a more accurate picture of what happened. 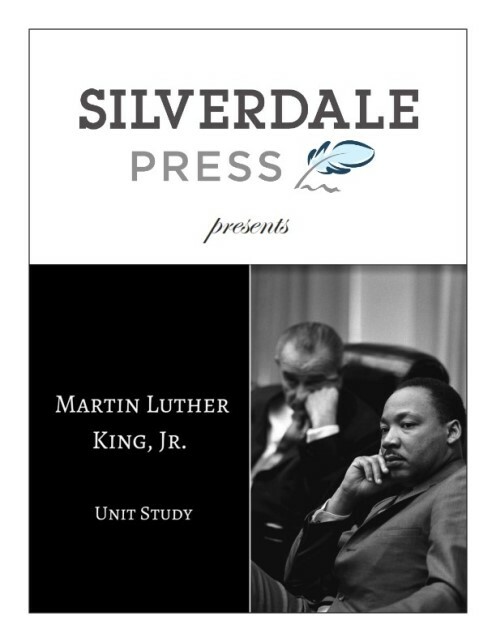 The Martin Luther King, Jr. Unit Study is 77 pages long, not including the answer key. My kids have done fairly superficial MLK lessons on the past, and we have a really good local museum that has an interactive exhibit about segregation and racism, so this was a familiar theme for them. That’s good, because this lesson was tougher than the Labor Day lesson. I would say that I would do the elementary lessons more with at 4th-6th, but younger kids can tag along. There are some mapping activities, timeline activities, copywork, definitions, and coverage of SCOTUS cases and related famous people like Ghandi. The timeline activities were important because this unit spans a long time. There are a couple of pages included for timeline and mapping, but we used our regular family timeline and maps instead. There’s an activity about segregating shoes, but my younger daughters were too upset about it so we stopped. They were crying too much about the left out shoes. The other activities were to make a bus boycott poster, which my kids enjoyed. Similar to the Labor Day unit study, the kids also made a drawing of someone holding a political sign. The last lesson in the MLK unit study is about how we got the MLK holiday. The rest is basically a bio of MLK and a rundown of civil rights history during and after MLK’s life. You can do a day of service at the end of this unit (and the unit study goes into why you’d do a day of service), but we didn’t have time to plan one during this very short time period we had for evaluation. The Labor Day Unit had a service day option for older kids, too. Next on our list to try is the Veteran’s Day study.